“The City of Industry was incorporated in 1957 in a move in part designed to prevent surrounding cities from annexing the land for tax revenue and as a shelter for those wishing to operate without the strict zoning laws of a typical city. It also allows a very small group of people — in many cases related to one another — to operate a municipality more like a corporation than a typical city”. The City of Industry’s vision in their general plan is to “be an employment base and commercial and business hub” (p19). The primary goal of the city is in “creating and maintaining an ideal setting for manufacturing” (p13). The purpose is to have “a job and employment base for the region” (p19 1.5.1). Policies “encourage the consolidation of smaller lots and large industrial lots to be occupied by a single tenant as opposed to multiple tenants” (p20 LU2-3), and “continually discouraged the development of new housing due to the inherent traffic, noise, and odours associated with business and employment users, which can be incompatible with a quality and safe living environment, and limits housing to existing residences” (p21). 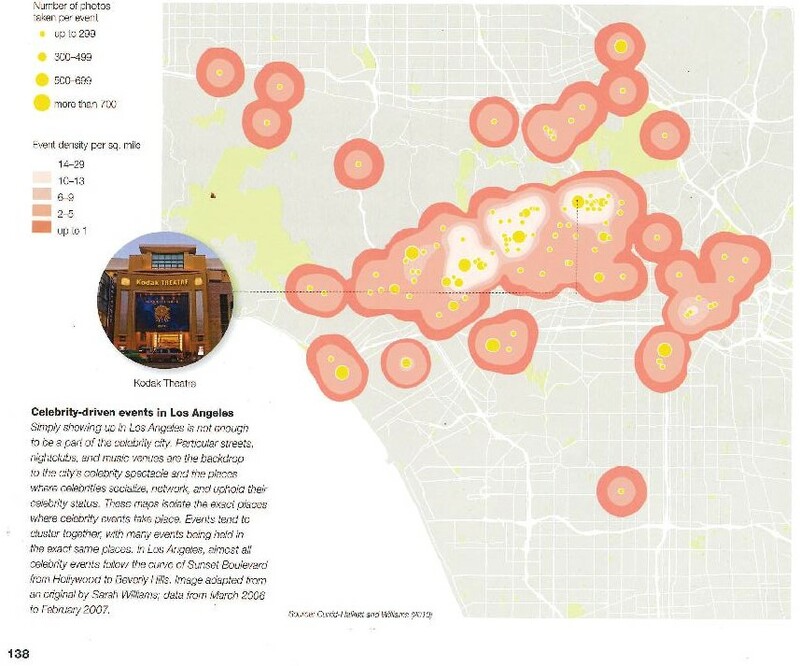 Now it is up to the reader to measure the employment value of an Industry only city versus mixed (living & working) in Los Angeles from the two images above, population density alongside concentrations of employment (from streets-blog post). 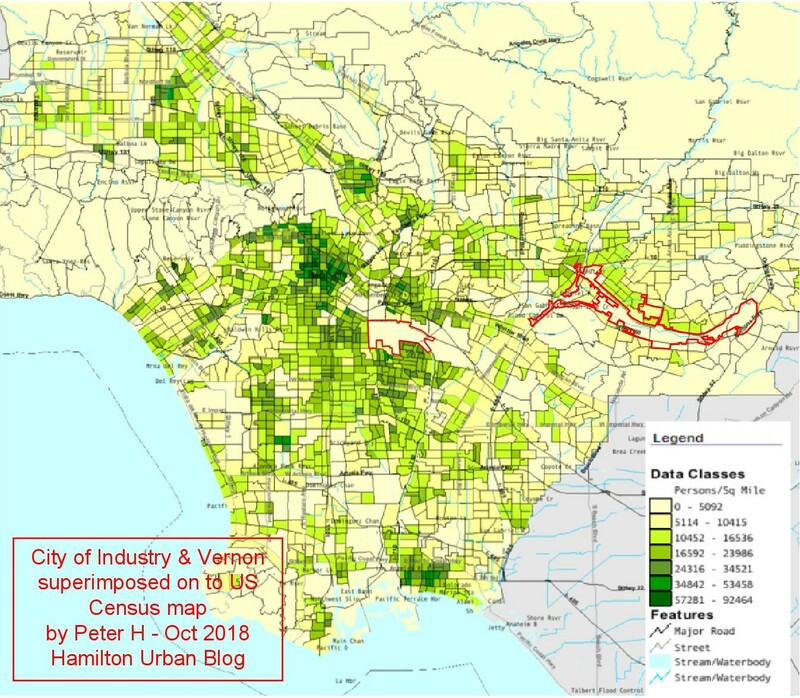 As a further measure of the value to employment (measured per km2) in a city, we can look at areas in Hamilton versus Los Angeles. The key thing to note about the City of Industry (the same general observations apply to the industry-only ‘city’ of Vernon, described in the list above) is that it is an industrial centre with only 219 residents according to the 2010 census, down from 777 residents in 2000. It does try to be social by having a golf club and a good resort, but consider the image above of the ‘geography of buzz’ (*see Knox, page 138), and its focus on celebrity-driven events. In reality, no amount of hard work in an industrial zone can replace the ad-hoc, unforeseen social interactions that open doors to new jobs, access to thinkers and investors, and expose people to new trends, ideas, and creative activity. Generally, establishing the right networks and meeting different types of people trumps endless nights working in quiet lifeless places. A city needs balance to be sustainable and liveable. *Knox, P (Ed.) (2014). Atlas of Cities. Princeton, NJ: Princeton University Press.